Australia says it is still searching for answers to fix its batting woes with the Ashes series on the horizon, admitting its batsmen got a “bit lazy” on day three of the fourth Test against India at the SCG. 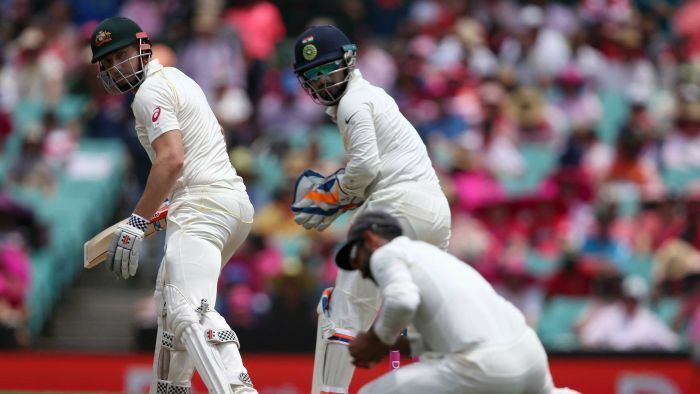 There had been high hopes Australia could make the most of the SCG pitch with the bat, as India did when it compiled a mammoth first-innings total of 7-622 (declared). Australia had started its first dig brightly to be 1-128 but the loss of opener Marcus Harris (79) triggered a collapse of sorts and it limped to an early stumps on 6-198 when bad light stopped play. No Australian batsman has made a century so far in the four-Test series, while Harris and Travis Head have accounted for half of the eight 50s the hosts have scored. Harris impressed again in Sydney, however what frustrated the Australians most was the number of starts their batsmen made, with three dismissed in the 30s and 20s, and two in single figures. Australia’s fielding coach Brad Haddin was left deflated following day three and said the coaching staff and players were struggling to solve the problem of batters not going on with starts. “That’s the million-dollar question at the moment,” Haddin told ABC Grandstand. One of Australia’s Test greats, Ian Chappell, has suggested the batsmen were simply not good enough, a worrying issue with the Ashes series taking place in England later this year. But Haddin believed the answer to Australia’s batting problems might lie simply with the mental attitude of the batters. “The guys are doing the work out in the middle, they’re getting to 20 and to me that is part of Test cricket,” he said. Haddin, who made four centuries as a wicketkeeper/batsman during his 66-Test career, admitted there was much soul searching happening in the Australian dressing room on day three, as each wicket fell. “It was a pretty quiet place, to be honest,” he said. “We had pretty perfect batting conditions, we had a good look at the wicket over the two days while we’ve been in the field. It was disappointing to see guys missing the opportunity on such a good surface. The form of Harris, who made his Test debut in the series opener in Adelaide, has been one of the few positives to come from Australia’s performances with the bat. His second half-century of the series showed he was not intimidated by facing the number one-ranked Test team in the world and he was unlucky not to convert the 50 into a maiden ton. Haddin was disappointed Harris did not go on and make his hundred after such a promising start. But he felt the 26-year-old had shown enough ability during the series to suggest he would enjoy a lengthy Test career. “It was just one of those concentration lapses, those decisions under pressure cost him that hundred,” Haddin said.